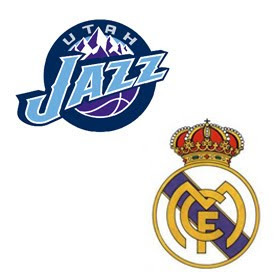 Although the game was much closer than it should have been through the first quarter, the Jazz eventually proved too much for host Real Madrid on Thursday (yes, I’m a little late getting this posted), cruising to an easy 109-87 victory. Game Ball Goes to: Paul Millsap. The clear MVP of the European trip, Sap scored 20 points on 9 of 10 shooting in only 22 minutes. He also had 3 boards, 2 steals, and a block. He’s making Utah look very smart for matching his contract offer from Portland this summer. Stat of the Game: The Jazz had 8 turnovers in the 1st quarter and finished with 23 for the game. Highlight: Eric Maynor hit a nice pull-up 3-pointer to beat the first-half buzzer. Lowlight: Goran Suton had more combined turnovers and fouls (5) than points and rebounds (4). Odds of his making the roster are pretty slim. - Deron Williams had another solid if not spectacular outing. He just looks to be in a different league than his competition (although in this game, I guess he technically was.) I expect a monster year from him. - Maynor is a playmaker. His shot still isn’t falling, but he had 7 assists and 2 steals in 24 minutes (Ronnie Price sat out with a minor injury). A couple of his assists were gorgeous. I’m feeling pretty good about the point guard position right now. - Kyle Korver played for the first time this season, coming back from a minor knee sprain sustained in training camp. He didn’t do much, but it was good to see him out there. - Daryl Dawkins (aka Chocolate Thunder) was in the stands, clad in a marvelously tacky yellow and black striped suit. The NBA TV announcers were cracking up. - Boozer actually looked pretty good defensively, recording 3 steals in only 20 minutes. Too bad, because this game would have been the perfect opportunity to comment on his penchant for matador-style defense.